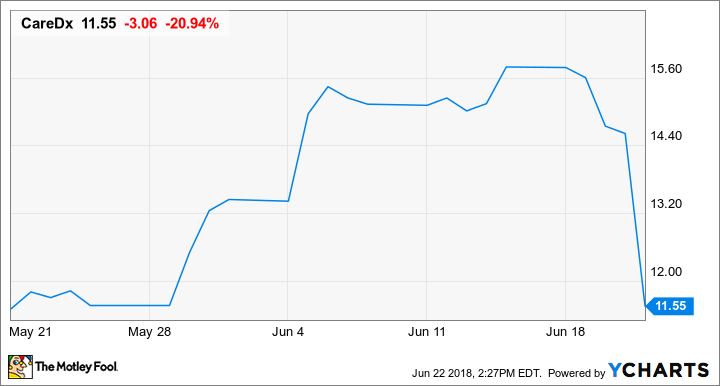 Shares of CareDx (NASDAQ:CDNA) are down 21% at 2:26 p.m. EDT, ending a monthlong run rather abruptly in what appears to be a sell-the-news event. The move up over the last month likely comes from investors' expectation that CareDx would be added to one or more of the Russell indexes. Companies were ranked as of May 11, although the preliminary lists of additions didn't happen until June 8, and CareDx didn't note that its addition to the Russell 2000, Russell 3000, and Russell Microcap indexes was official until June 19. Investors sometimes try to jump in ahead of buys by exchange-traded funds and mutual funds that follow the index. The changes for the index take effect after the markets open on Monday, so short-term traders appear to be selling and moving on today. Long-term investors should ignore the gyrations over the last month and focus on the company's AlloSure test for posttransplant surveillance. Revenue was up 21% in the first quarter, but it came off a relatively low base with total revenue of just $14.1 million during the first quarter. To hit management's revenue guidance of $64 million to $66 million, CareDx will need to add additional transplant patients as customers. But just as importantly, the company needs doctors and patients to see value from its testing and become repeat customers. In the first quarter, the company added 568 new standing orders to the previous 115 standing orders, so the trend is certainly in the right direction.